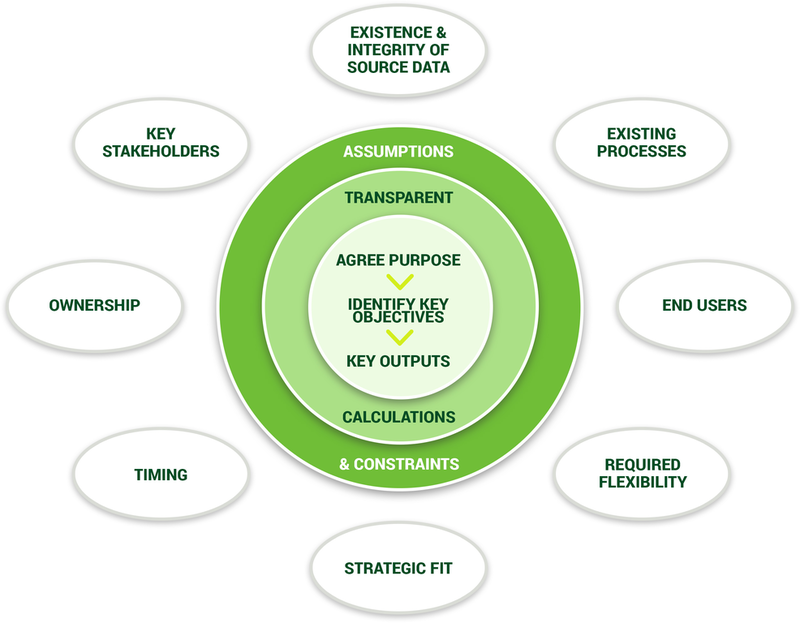 Recognise context, obtain internal ownership, identify key stakeholders and end users. Need to define the purpose / objectives, content, flexibility and boundaries of the forecasting model (e.g. key outputs, core assumptions, limitations). Ascertain how project will fit in with existing processes (e.g. budgeting, statutory reporting, internal auditing). Confirm what’s in and what’s out. Ensure consistency with and non-duplication of existing processes (e.g. Accounting / Management Information Systems and existing Excel files). Firm up periodicity and timelines. Plotting the high-level relationships identified in the Planning stage helps to understand the main issues. Building up logical linkages gives rise to an influence diagram which can readily be used to construct a very simple, yet highly relevant communicative tool and / or strategic model. Can be used to evaluate the impact of different choices taken and assess the impact of the variability of forecast data going forward (one indicator of risk). Construction in accordance with your wishes in accordance with recognised best practice modelling principles. Regular updates / discussions with key stakeholders. Models must be tested before going ‘live’. Incorporate checks into the model. By stakeholders / end users. By third party model auditors. Develop Model User Guide, where necessary. Provide on-going support as required.